Pretty Penny is licensed under a Creative Commons Attribution 3.0 Unported License. Permissions beyond the scope of this license may be available. Posted to Flickr on 01 April 2013. Part of the Little Dudes series. Included in my Portfolio. These little dudes are not as little as you might think. 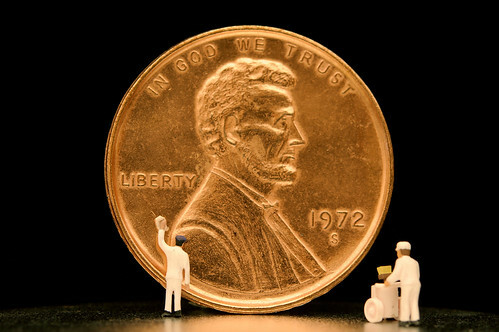 The penny is a fake, measuring three inches tall. Documenting the little dudes who live in my home. Photo submitted to the Flickr group Macro Mondays for the "I Fooled You!" theme. The setup for this photo is relatively simple. The backdrop is some black fabric. The base of the photo is a large black shelf that I often use. On top of that is an upside-down pan, which forms the “floor” of the photo. The two little dudes are HO scale model train figures. The washcloth in the hand of the man on the left is actually a small piece of paper towel with a little bit of modeling glue. The penny is a gag prop that I’ve used in a few other photos. It measures three inches across. I included my hand in the setup photo to illustrate how much larger it is than a normal penny. Above it all is a large circular diffuser that I nearly always use for my tabletop photography. This photo was posted to Flickr on 01 April 2013. It was one of 500 images featured on Flickr Explore for that day. The last time I checked, it had 40,026 views on Flickr. Pretty Penny by JD Hancock is licensed under a Creative Commons Attribution 3.0 Unported License. Permissions beyond the scope of this license may be available.